Can we talk about breathing in Pilates? Do you ever find yourself so focused on getting the movements right in your Pilates workouts that you realize you’ve forgotten to breathe? Or do you sometimes feel like you don’t know whether you should be breathing in or breathing out when making certain movements? Joseph Pilates, the founder of Pilates (or “Contrology” as he originally called it), emphasized awareness of proper breathing and alignment. He suffered from asthma and other ailments as a child, which motivated him to learn about healing and strengthening the body through combining proper breathing techniques (intercostal breathing) with focused movements. He encouraged full, intentional breathing in life and in exercise. Breath has the power to transform the body and mind. When practicing Pilates, we exercise our lungs by breathing deeply and synchronizing our breath with the movement. Intercostal breathing, also known as lateral breathing, requires you to breathe deeply enough to feel your rib cage expand along your sides and your back. You can practice this type of breathing in rest pose (also known as “child’s pose”). We practice intercostal breathing in Pilates so that we can keep our abdominal and oblique muscles engaged from one movement to the next. When you focus on intercostal breathing, you allow your rib cage to expand, and your lower abdominal muscles remain engaged (unlike when breathing only into your belly). Learning to breathe this way allows for deep core connection while also sending oxygen to your muscles and improving brain function. This helps us get even more out of our workouts! Joseph Pilates also believed that “lazy breathing converts the lungs, literally and figuratively speaking, into a cemetery for the deposition of diseased, dying and dead germs.” It’s true that most of us use only a fraction of our lung capacity on a daily basis. Joseph believed that removing stale air from the lungs was an integral part of optimal health. And with what we know now about the power of breath and the way it signifies positive reactions in our brain and body, he was well ahead of his time! While it’s definitely important to aim for proper form and using our breath to get the most out of our time on the mat, I’ve learned from working with clients that the way breathing affects movement and muscle engagement is not always a one-size-fits-all scenario. I recommend that you first get comfortable with the movements and exercises before getting caught up in trying to master the proper breath pattern. 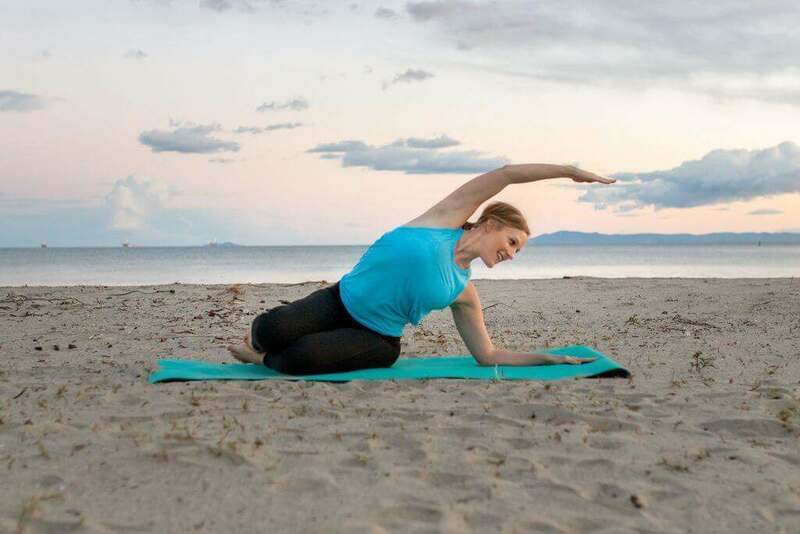 Once you feel coordinated in performing the movements properly, you can focus on breathing deeply into the sides of your rib cage and back, which will facilitate each exercise, especially when your muscles contract. I encourage you to experiment with breath patterns and notice how it affects your movement and ability to feel the work in your body. You might find that a specific movement lends to breathing in vs. breathing out as a better fit for you. We are all unique and at different levels in our Pilates journey. Try to experiment with what feels right to you, and continue to practice proper movements before trying to master breath patterns. The MOST important thing is that you breathe. Taking deep, intentional breaths has the power to oxygenate your blood, reduce stress, boost immune function, assist in muscle activation, boost your energy, and elevate your mood. All good things! As you get the hang of proper Pilates breathing, be gentle with yourself. Remember, as always, to focus on progress over perfection. PS – If you want to learn more about the Pilates principle of breathing, check out this Daily Breathing Exercise I created with you in mind. So helpful! Breathing helps maintain vitality through our lives as we age! Thank you Robin, I find the breathing keeps my core stabilized on the mat. A.
Thankyou Robin. All good reminders that everything is process over destination and to be kind to ourselves through the learning. ❤️ I consider myself lucky to have found you as a guide through this. You are very succinct in your delivery. As usual, thank you Robin! I love that you always teach us the “how’s” and the “why’s”! Hi I have to get a full hysterectomy in a couple of months will it be alright to keep exercising before and after I have a large cyst in my ovaries as well ?